Recently a number of articles have been released about temperature, brown fat, and sleeping patterns. While we all know that sleeping is essential to fat loss and steady cortisol levels, we forget (or we aren’t aware) that it actually can play a part in metabolism. Brown fat has been discovered on the upper backs and necks of humans. These small patches of fat have been documented to increase calorie burning, and stabilize blood sugar. 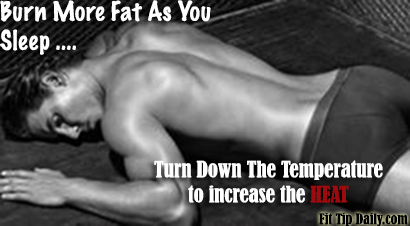 In a recent study, they tested this even further by linking brown fat to sleeping temperatures. It wasn’t until recently that brown fat hit the scene. Scientists thought that brown fat didn’t exist in adults at all. This small amount of fat is unlike the white fat we hate! Studies on mice have shown that brown fat actually removes sugar from the blood. This aspect alone could help to further a cure for diabetes in the future. 4 healthy men were chosen. All of them reported to the sleep chambers at 8 pm daily for 4 months. Each man was assigned to light sleep wear (scrubs) and sheets only for bedding. All meals were provided to keep their calorie intake constant. The first month the bedroom was set at 75 degrees which is considered a neutral sleeping temperature. This remained constant for 1 month. The next month they switched the temperature to 66 degrees. This was a much colder temperature that would allow the production of brown fat without inducing shivering. The following month the temperature was turned back to 75 degrees then up to 81 degrees. Brown fat, blood sugar levels, insulin and calorie intake were all measured through out each month. The coolest temperature changed the men’s bodies noticeably. The brown fat increased by double and the insulin resistance changed. The changes were slight but meaningful, says Francesco S. Celi, the study’s senior author and now a professor at Virginia Commonwealth University. “These were all healthy young men to start with,” he says, “but just by sleeping in a colder room, they gained metabolic advantages” that could, over time, he says, lessen their risk for diabetes and other metabolic problems. The men also burned a few more calories throughout the day when their bedroom was chillier (although not enough to result in weight loss after four weeks). The metabolic enhancements were undone after four weeks of sleeping at 81 degrees; in fact, the men then had less brown fat than after the first scan (source). So what’s the moral of the story??? Sleep in light clothing (or none) with the temperature about 66 degrees to stimulate more brown fat and increase usage of insulin! Of course it would be advised to workout with this and eat healthy also! !